Enjoy our quiet, private, spacious 4500 sq ft single family home away from the crowds. Quite gated community with easy access to Beaver Creek and Arrowhead ski areas, and only 20 minutes to Vail. Sleep better 1000 feet below the ski villages. Park 10 feet from your front door and bring groceries and luggage in without huffing up stairs! Relax in the private hot tub and enjoy the stars. Enjoy dining in, playing pool, shuffle board, darts or board games with your group. Enjoy the breathtaking views and wide open spaces. You'll never again settle for a noisy, crowded condo on the mountain!! Large Lexus SUV (seats 7) available for local use (damage deposit required). Airport pickup can be arranged with our property manager. This is our home away from home 4 months a year. It has a great floor plan for group gatherings. Garage, kitchen, hearth room, dining room, great room, office and master on first level. Second master and 3 other bedrooms and large game room on lower level. Three kings, one queen and a bunk room with two sets of bunks each with regular size mattress on the bottom and twin on top. All rooms have views and direct access to covered porches. Each bedroom is decorated to a theme. You'll know when you drive up that this is not really a rental unit! We had an excellent time at this Cordillera Valley home. John was very responsive and our ski week was a huge success. We had some minor issues with a fireplace not turning on and a pilot light going out, but Eddie, the maintenance man was there within 15 minutes to get it taken care of. The loaner car for local driving was a huge benefit for us and I'd recommend this home to families seeking a cozy home near Vail or Beaver Creek. Hot tub, sledding on the golf course, easy access to Beaver Creek, plenty of baby accessories for our 10 month old grand daughter made this the perfect setting for family ski trip. The spacious living areas and comfy furnishings allowed us to spread out for quiet times when needed or come together for some great family times. We would return here without hesitation. Getting harder and harder to find houses big enough to fit my expanding family of 14 but this house worked out great. All the kids enjoyed the playroom and the adults enjoyed the large well-appointed bedrooms and 2 dens. The house was fully equipped and everything was in working order, plus Eddie the manager was very responsive on questions and small details/questions. A quick 15-20 minute drive to Beaver creek for skiing and easy access to I-70 made it a great spot. Even had items for babies and kids like plastic dishes, cribs, and pool table/shuffleboard they used daily. adults loved the hot tub and views. 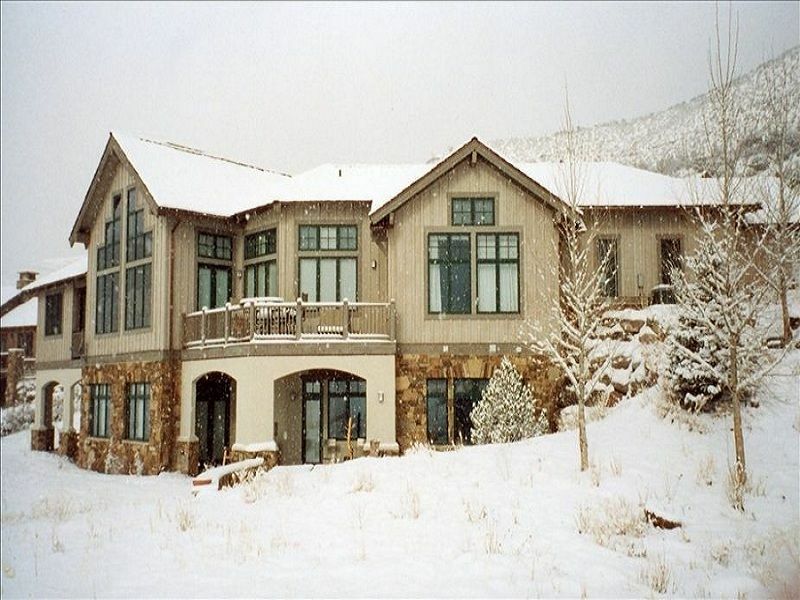 This lovely home is situated with the most beautiful views in all of Colorado. The floor plan of the home makes it conducive to smaller more intimate group visits or for large family vacations. It has all of the comforts of home! The fabulous kitchen made mealtimes an event to look forward to. Grilling out on the upstairs deck and finding fresh cuisine from the local grocery, all helped complete the perfect stay. Excellent home we were there with our adult children and our grand children 13 of us in total. The 5 grandchildren all stayed in the bunk bed room which gave us 4 bedrooms for the 4 adult couples. The kitchen was well equipped and the house was well laid out. Could not have asked for more. We all had a great time. Just spent the last 5 days enjoying our perfect vacation in this beautiful home. We will definitely be booking again and recommending this rental to any friends or family that travel here! The home is spacious, clean, and decorated with all the rustic touches you would expect in a mountain house. The beds are super comfortable. The game room was amazing for the kids and the adults. We loved having coffee in the morning room watching the elk. One day we laid low and spent some time in the hot tub, sledding in the side yard, and taking naps. The kitchen is well equipped. We skiied in Beaver Creek almost every day. About a 10 minute drive. We have been on ski vacations before with 2 families of 5. This was our favorite property and I am certain we will be back. Cancellation policies--within 60 days of arrival date no refund, 61-90 days 50% refund, more than 90 days full refund.